An international company specialising in an intangible but priceless commodity – peace of mind – has gone live with a new website designed and built by CuCo Creative. Surrey-based Platinum Security Risk Management offers counter-terrorism and personal protection strategies to a global client base. 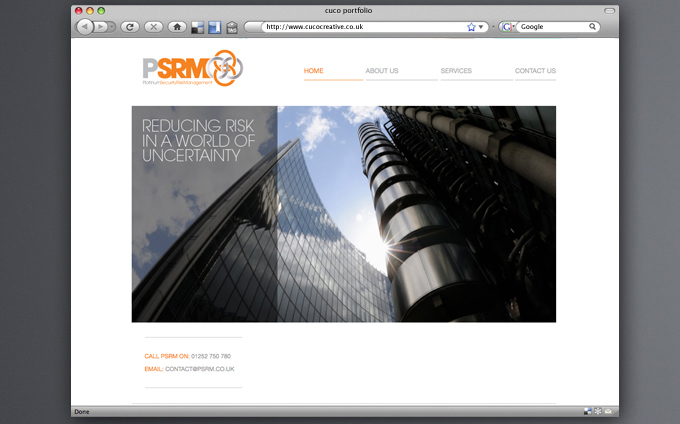 The brochure website – based on the core theme of Reducing Risk in a World of Uncertainty – explains PSRM’s rationale and provides an overview of its services. “We’ve used bold, big-business imagery to emphasise the scale of PSRM’s corporate operations throughout the web design,” said CuCo director and senior designer Tony Cook.